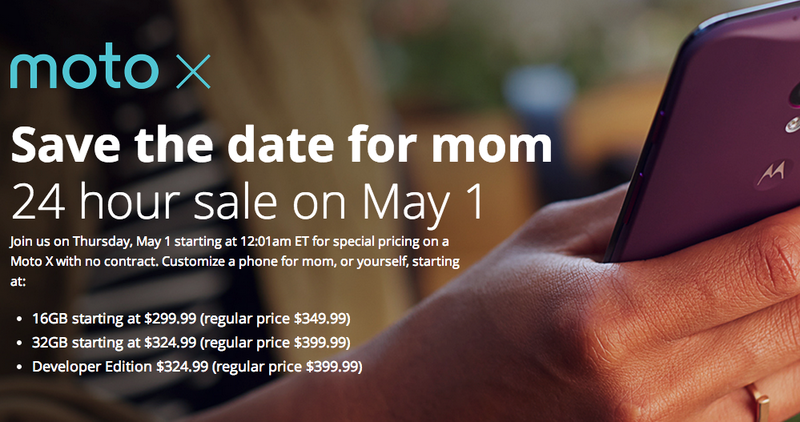 On May 1, starting at 12:01AM ET, Motorola is hosting a 24-hour sale for their 2013 flagship, the Moto X. The 16GB model will drop to $299 at full retail (normally $349), while the 32GB version can be had for $324.99 (normally $399). The Developer Edition will also drop to $324.99. We called the Moto X our top Android phone of 2013, even with its below average camera. The total package was something refreshing in a smartphone world filled with nothing but oversized phones. The Moto X not only feels great in hand, it performs wonderfully, includes a handful of innovative features like Active Display, and can be customized to your liking through MotoMaker. With that said, the phone is no longer new. It is still a hell of a phone, but we can’t help but point out the fact that we will see the new Moto X in a few months. Motorola has told us to expect one in “late summer.” Then again, at $299, it may be a nice placeholder while you await the arrival of the new model, assuming you have some cash to blow.